In association with the International Center of Photography, New York, we are pleased to announce Floriane de Lassée as the recipient of the first jgs Publication Grant at icp. 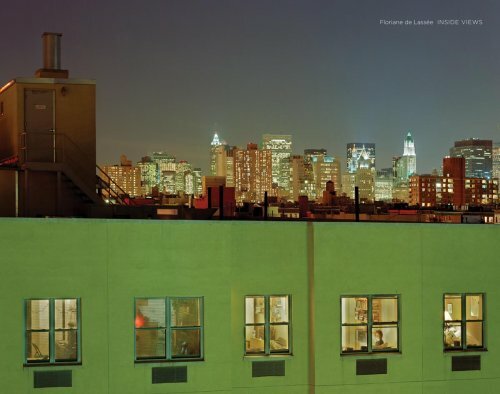 During her time in New York, while studying at the icp, de Lassée began to explore the built environment and to document the cityscape at night. Post graduation, as her career took off, de Lassée built on this early work, photographing night scenes in New York, Tokyo and Shanghai. A selection of these photographs was brought together for the artist’s exhibition “Night Views,” featured at the Arles Photography Festival in 2006. Inside Views, de Lassée’s first monograph, comprises 42 of the artist’s most powerful night cityscapes to date, and serves not only as a broader introduction of the work for which she is already known in Europe, but also as a bridge between her earliest work in the series, and the transformations it is currently undergoing. Floriane de Lassée is an original force in contemporary photography; Inside Views, a stunning first monograph, is beautifully printed in an oversized format, and opens with an introduction in English and French by Virginie Luc.